Banglatown comes alive in the evening. 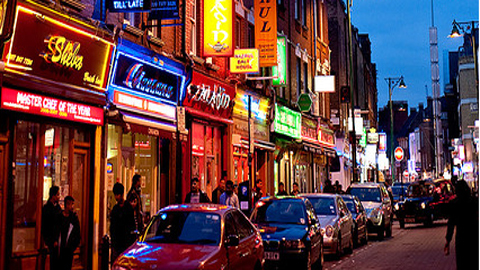 Brick Lane has long been considered the home of London’s best curry. This part of the city experienced an influx of Bangladeshi migrant workers in the 1970s, and, by the end of that decade, the southern end of Brick Lane and some of the side streets had become home to numerous Indian/Bangladeshi restaurants. Because of the large number of curry-houses, the Jamme Masjid and a plethora of other Bangladeshi-owned businesses (such as Taj Stores and numerous garment shops) this area of Spitalfields is known as 'Banglatown'.